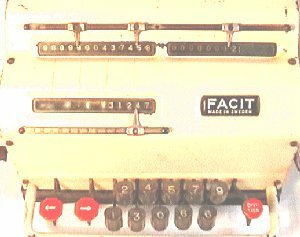 Before punched card accounting, on the left is a typical mechanical calculator of the 1936 to 1956 period, A Facit TK, Key entry, Pin wheel setting, with the absolute luxury, of a division key. Which meant you did not have to enter all those extra zeros to start the calculation. 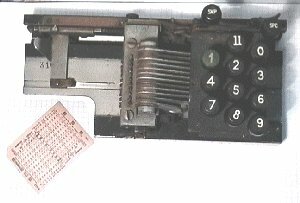 The logical operations were performed by the operator ( comptometer ), Addition, Subtraction and Multiplication ( repeated addition ), and the machine did the arithmetic. From Babbage to here was a milestone in itself. But the revolution that computers were to bring, to the office and the the rest of the world was only just starting. Even when they arrived the early devices were heavily mechanical, see the print mechanism set up on a Senior Tabulator, below right. 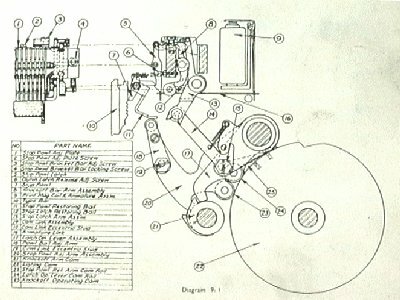 When the 25 parts, for each print position, were set up to specification, you then had to get it working. Hands up all those engineers who get it to work first time, Ah! Huh! ( none ), I am so glad I am not the only one ! 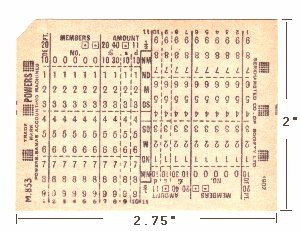 Punched Cards, were standardized, for most of the industry, at 80 Columns, but there were other formats, see below for a 21 column, punch and cards, as Produced by Powers Samas. The company was later merged with ICT, however the incredible fact was that, the Powers Samas machines, from puches to tabulators, were mostly mechanical. If you took the covers off, you could wind the machine over by hand, and without power applied, it would read cards, calculate totals. Then print the result, the program to do all of this was enshrined within another mechanical wonder, the connection or ( CON ) box. The picture of the 21 Column card below shows, that the card could be used as printed, with data in columns 1 to 10, then turned upside down, at a later date, and reused the other end, making for a very economical use of media, and the ultimate in recycling. 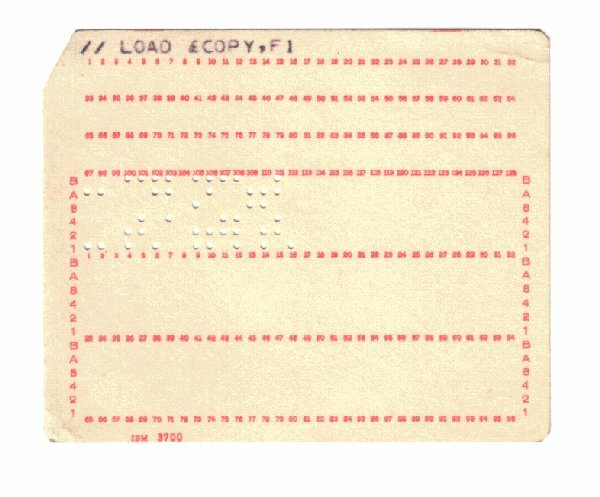 Below is a typical punched card of 80 columns standard. There were machines between the existing Data processing machines and the early computers One of these was the ICT 555 Calculator, which read cards in one cycle and calculated the answer between cards moving from the read station to the punch station, just in time to punch the data into unused columns of the card just read. The program to do this was set up on a plugboard. It was not a small machine, but would solidly continue to calculate all day long. The logic was early in design, and a single logic element is displayed below. Valve Logic= Single Flip Flop for type 555 Calculator. (c)1959. 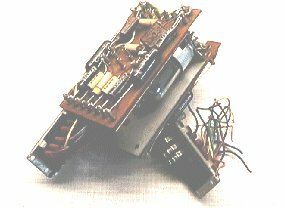 Also an oddity of the punched card era, an IBM 128 Column Card, Using holes smaller than punched tape and coding in 6 bits of data, there were four rows of 32 columns in the same card. This was a brave attempt to keep punched cards in use, but they had had their day.